In Chinese mythology, Chi You (蚩尤) is a war deity who fought the Yellow Emperor. For Hmong, Chi You is a sagacious mythical king. Chi You, "Xib Ywj" sounds like "Txiv Yawg" which can be used as a title or more literally " old man" in Hmong. 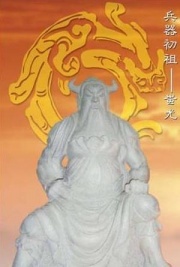 Chi You is also the god of rain, and a descendant of Shennong, the inventor of agriculture. His appearance is half man, half bull, with the front of his head covered with (or made of) iron. Along with Yan Di and Huang Di, Chi You is a deity in Hmong mythology, Chi You was the mythical leader of the Hmong, king of Jiuli, and once a follower of Yan Di. When Huang Di subdued Yan Di, Chi You was weary of the suppression and conspired with Yan Liang, another deity. Soon, Huang Di and Chi You clashed in the Battle of Zhuolu. According to Chinese legends, after Huange Di had subdued Yan Di, Chi You and his people invaded the lands that belonged to Yan Di because Yan Di's clan was growing at an alarming rate and posed a threat to Chi You. Yan Di's clan then sought assistance from the Yellow Emperor (Huang Di) and both fought against Chi You at Zhuolu plains. Both sides used magical powers, but Chi You had the advantage because his troops were armed with forged swords and halberds. Using his power (perhaps a mythological explanation of meteorology used in warfare), Chi You covered the battle field in thick fog. Only with the help of a magical compass chariot (South Pointing Chariot) could Huang Di's troops could find their way through the mist. He also used his daughter Nü Ba, the Goddess of Drought, to harm Chi You's troops. Later on, Chi You suffered more defeats and was captured. Only Yinglong, the winged dragon, being a brave servant of Huang Di, dared to slay him. Chi You's chains were transformed into acorn trees, while Yinglong was cursed to remain on earth forever. According to Chinese legend, the people under Chiyou (蚩尤 Chīyoú) were defeated at Zhuolu (涿鹿 Zhuōlù, a defunct prefecture on the border of today provinces of Hebei and Liaoning) by the military unification of Huang Di (黃帝 Huángdì) and Yandi, leaders of the Huaxia (華夏 Huáxià) tribe as they struggled for supremacy of the Yellow River valley. The South Pointing Chariot the crucial reason of Huaxia's victory. The battle, believed to have taken place in the 27th century BC, was fought under heavy fog. However, due to Huaxia's leader Huang Di inventing the South Pointing Chariot at that battle, the Huaxia were able to negate the effects of the fog. After the loss, the original tribe split into two smaller splinter tribes, the Miao (Hmong) and the Li (黎 lí). The Miao migrated southwest and Li southeast as the Huaxia race, now known as Han Chinese race, expanded northwards. During the course of Chinese history, they were regarded as "barbarians" by the increasingly technologically and culturally advanced Han Chinese. Some fragments of the races were assimilated into the Chinese during Zhou Dynasty. Yet, in other versions, the people of Jiuli fragmented in 3 different directions. It is said Chiyou had 3 sons, and after the fall of Jiuli, his oldest son led some people south, his middle son led some people north, and his youngest son remained in Zhuolu and assimilated into the Huaxia culture. Those who were led to the south established the San-Miao nation. Perhaps due to this splitting into multiple groups, many Far Eastern people regard Chiyou as their ancestors, and by the same token, many question the ethnicity of Chiyou as exclusively Hmong or otherwise. In some circles of thought, the Koreans also regard Chiyou as an ethnic ancestor. Chiyou is also regarded as one of China's forefathers alongside the ethnic Han ancestors, Huangdi and Yandi. Other mythology states that Chi You had 81 brothers, and was a grotesque looking creature: he had six arms, four eyes, the head and hooves resembled an ox and his head was made of metal (copper and iron, mentioned 銅頭鐵額). He was actually not of such a creature, but wore an iron mask that enabled others to see him as such. His disguise enabled him to mislead those who approached him and thus, saw him as a beast. He only ate stones and pebbles; therefore his teeth were almost unbreakable. One of his achievements was the first use of metal weapons in warfare. He is said to have forged the first swords from bronze or copper. In the same manner as his iron mask of heavy metal. He was violent and no one could defeat him. "Huang Di ordered his men to have Chi You beheaded... seeing that Chiyou's head was separated from his body, later sages had his image engraved on sacrificial vessels as a warning to those that would covet power and wealth." This has led some researchers to believe that the Taotie motif widely used in bronze decor is a reference to Chiyou and is used to serve as a warning to people who covet power and wealth, like Chiyou who tried to covet the land belonging to Yandi. Across the Eastern Asia, many people had worshipped Chi You as the war guardian deity. According to Chinese history record Records of the Grand Historian, Liu Bang worshipped at Chi You's shrine before the last battle against Xiang Yu and won. Joseon Navy Admiral Yi Sun-sin also worshipped Chi Woo, and he has never lost a battle, and thus deemed a hero in the war against Toyotomi Hideyoshi's army during the Seven Years' War during 1592-1598. According to the controversial Korean mythology book Hwandan Gogi which was first published in 1979 and which says it was compiled and edited by Gye Yeonsoo in 1911, 'Chiwoo' was 14th Emperor, named Jaoji-Hwanwoong, of the Empire of Baedal which was to be succeeded by Go-Joseon, as the book says. He ruled the Empire during 109 years. According to these accounts, Emperor Chi-Woo succeeded Emperor Sawara of Baedalguk, the 13th ruler of Baedalguk, at around 41 years of age and is seen today as a great hero who expanded the territory of his empire tremendously, which was said to have reached the Shandong Peninsula area at its greatest extent. During his reign, he was said to have highly advanced the technology of his empire as well. Baedal was said to have possessed catapults, flaming arrows, and bronze swords starting from the reign of Emperor Chi-Woo, while its neighbors were still in the stone age. Chi-Woo was said to have reigned for 109 years, and died at the age of 151. He was good at making weapons such as bows and arrows, along with armor and helmets, and he also could deal with copper and iron. In addition, he united 12 feudal states, and was not defeated for about 70 wars. The book claims that Chiwoo's grave is in the present-day Shandong province of China, and that in every July, a red flag, the symbol of Chi You's army appeared on top of his grave. Chiwoo, also called "Chiwoo Cheonwang" (치우천왕, Hanja 蚩尤天王, meaning 'Chiwoo, King of Heaven') in Korea, is the mascot of the Red Devils, the supporters' group of the South Korean national football team. The manhwa Heavenly Executioner Chi Woo is partly based on the legends about Emperor Chi Woo. ↑ Lee, James. (2006). James Lee Astrology guide 2006 English edition. World publishing co. ISBN 962-432-503-0. Ultima modifica per la pagina: 12:15, 22 gen 2014. Questa pagina è stata letta 10.139 volte.